It’s that time of the year again and Social Media Examiner has just released the latest version of its annual Social Media Marketing Report. The big news is that this year, research has found that marketers consider Facebook and LinkedIn to be the most important social media sites, and that if they were forced to choose just one, the majority (52%) would choose Facebook. This is somewhat surprising. Whilst LinkedIn is experiencing strong growth, with earnings for Q4 up 44% from the same period in the previous year and “full year revenue” up 45% with a total annual revenue of $2.2 billion. “Q4 was a strong quarter, bringing to a close another successful year of growth and innovation. One year ago, we began a number of multi-year strategic investments in the platform. We continued our transition from desktop to mobile, and also focused on initiatives in jobs, content, and global expansion. While still early, we made significant progress on these priorities in 2014, and maintained solid growth across all member ecosystem metrics while delivering record financial results,” said LinkedIn CEO Jeff Weiner. When it comes to Facebook, there have been plenty of brands bemoaning the lack of organic reach this year. 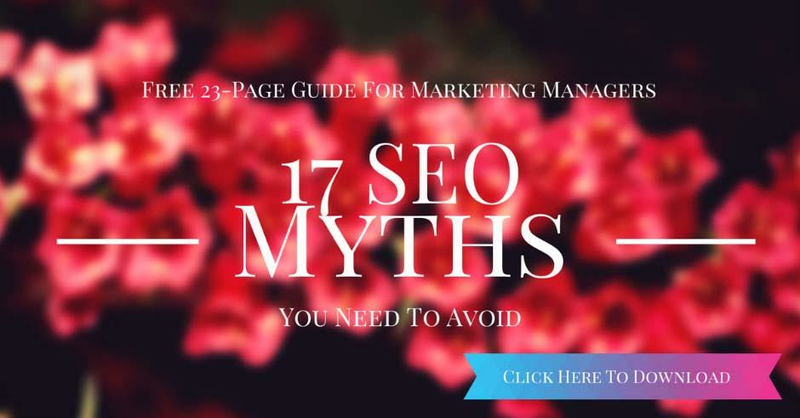 However, the site remains the most popular in general and also with marketers. Despite this, just 45% of marketers believe their Facebook marketing to be effective. Unsurprisingly, most marketers that participated in the survey (91%) said that they would like to know the best strategies and tactics for improving social media overall and increasing engagement – that Holy Grail of modern marketing. It’s not easy for smaller brands to achieve engagement on any forum, including comments on blogs. Facebook is also especially difficult to gain any engagement on due to the lack of organic reach. B2C marketers were more positive about the use of Facebook than B2B, and this is to be expected as Facebook has always been seen as more of a consumer-based platform. It was also found that large brands tended to perform better on the site. You should of course also look to post frequently (but not so much that it irritates followers) and you should engage with comments as soon as you can. I find that on Twitter, followers also appreciate a personal thank you for retweets and carrying this out can substantially boost the average number of retweets that you get. This is time-consuming however, depending on how many followers you have, but it can’t be done with scheduling software as it’s the personal touch that makes the difference. The survey also found that 96% of marketers use social media for marketing a business, but just 42% agreed that they were able to measure their social media activities and provide ROI. This is rising every year however, and as the research also found that 72% analyse their efforts, it’s likely that we’ll see this continue to rise, especially as social analytics are improving all the time. There are lots of social media tools on the market now to help marketers cut the amount of time spent on posting, commenting and curating. For those that have been working with social for less than 12 months, it was found that 49% of them spend five hours or less on social each week. However, for those who had been working with social for more than two years, at least 68% spend upwards of six hours on social. It was also found that age influences how much time is spent marketing with social media. The younger the marketer, the more likely they were to spend more time on social than their older counterparts. When it came to what benefits marketers expected to see from social media, increased exposure and increasing traffic came out on top. 90% of marketers who participated in the survey agreed that social media has generated more exposure for their business and 77% said that it had increased traffic to their site. “Most marketers are using social media to develop loyal fans (69%) and gain marketplace intelligence,” the report said. Generating sales through social was linked to the amount of experience the marketer had. The study found that those who had been working with social for longer experienced good results when it came to generating sales. Improved sales was also linked to the amount of time spent on social, with more than half of those asked agreeing that sales improved when they spent more than six hours on social. 73% of those that spent 40+ hours also said that it had helped to boost sales. Marketers that spent just six hours per week on social reported that they see lead generation benefits from social media too, and more than half of those asked said that with just one year of social media marketing experience, they were generating leads. Importantly, it was also found that using social media for marketing purposes reduced marketing budgets overall. The go-to platform remains Facebook with 93% of marketers using it, and Twitter coming in at second place with 79% using it, following by LinkedIn with 71%. Despite the changes we’ve seen take place on Google+ this year (and the inevitable death knoll that sounds around the internet every time changes are made), the platform still came in at third with 56% usage. I still find G+ to be a useful platform for sharing personally and it’s also great for getting picked up in search and for this reason alone, shouldn’t be abandoned just yet. Facebook did see a slight drop in popularity by 1% this year however, presumably due to the algorithm changes that have prompted so many posts that advise users to leave the platform. Twitter also saw a 4% decrease in use, whilst G+ saw a 2% increase, which somewhat puts the idea to bed that’s it’s not a useful platform. Instagram usage saw the biggest increase though, rising from 28% last year to 36% in 2015. YouTube was found to be more commonly used by large brands – 71% of companies with more than 100 employees used the video site, whilst just 38% of those businesses with less than 100 staff members used it. Marketers used social platforms differently depending on their audience in 2015. B2C companies tended to make more use of Facebook, Pinterest and Instagram than their B2B counterparts. However, B2B companies made more use of all of the other platforms and made significantly more use out of SlideShare, which was included in the report this year for the first time. B2B marketers were also much more likely to use LinkedIn compared to B2C. When it came to how marketers plan to use social media going forward, it was found that they plan to increase use on the following platforms, in order of importance. 82% said that they have no plans to use Snapchat in the next year, whilst 61% have no plans to use Vine. So whilst marketers are coming to realise the importance of video marketing, and are looking to increase efforts on YouTube, they are not looking to utilise the social networks more commonly associated with use by young people. It’s interesting too that brands are still looking to use YouTube, given that Facebook native video has now surpassed YouTube in terms of views and engagement. However, the report doesn’t indicate how marketers are intending to spend time on Facebook, so this could include video. 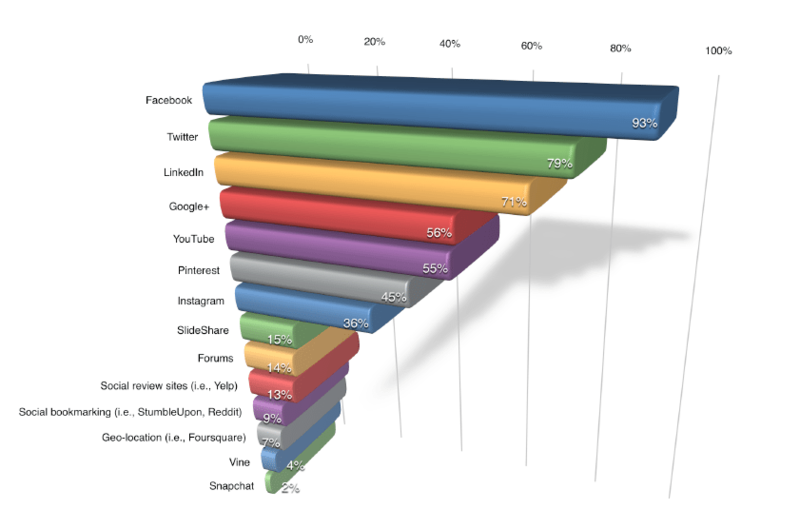 The report also looked into what marketers are most keen to learn about in social media this year. It was found that Facebook was the social network that B2C marketers most wanted to improve their knowledge on, whilst B2B marketers were more interested in learning more about LinkedIn. Facebook was the most popular choice for learning about for both newcomers to social marketing and for those with more than five years’ experience. The survey asked marketers which forms of paid social they used on a regular basis and it was found that “the overwhelming majority use Facebook ads (84%)”. This was followed by Google ads at 41% and LinkedIn at 18%. Facebook dropped this year, down 6% when compared to 2014, whilst LinkedIn saw ad usage drop by 2%. However, 56% of those asked said that they have no plans to use Twitter advertising at all this year. When it came to the types of content used by marketers in social campaigns, it was found that visual content was the most commonly used at 71%, followed closely by written content (blogging) at 70%. “Podcasting is only used by 10% of marketers and represents an opportunity,” the report said. Almost half of those surveyed (45%) said that they consider blogging to be their most important content on social, followed by visual assets and video. The written word then remains an important part of the social marketing mix, especially for B2B companies and people who are self-employed. When asked what they wanted to learn more about with regards to content, marketers said that they want to improve their knowledge and understanding about video (72%), blogging (69%), visuals (68%) and podcasting (43%). It was also found that when new social networks emerge, just 5% of marketers adopt new platforms, although some do register usernames. This could be with a view to using the platform if it takes off in the future, or it could be for reasons relating to reputation management. It’s interesting to note that Facebook remains the most popular platform for social media marketing and that the majority of businesses that use social advertising use Facebook the most. Despite the changes that have meant that the site doesn’t offer as much in the way of organic reach, clearly its advertising is working for many. We’re still seeing many brands beginning to adopt video for use in their marketing campaigns too. Video is a great way for boosting engagement for all businesses, so it’s encouraging to see further adoption. It’s interesting too to note that the written word is still regarded as being central to the marketing campaigns of businesses of all sizes and across all sectors. For those marketers who are still finding it difficult to measure the effects of their social media campaigns, more education on integration and analytics is clearly needed. Social analytics have improved vastly over the course of the last few years, with Pinterest and Twitter now offering analytics as well as Facebook and LinkedIn. This entry was posted in Marketing Manager, Social and tagged facebook, linkedin, social media marketing report 2015. Excellent post Kerry. Interesting to see the findings that 66% of marketers intend to increase usage of Twitter as well. Twitter seems to be becoming increasingly irrelevant to most companies, so it’s interesting to see such a strong finding from the study. Facebook is definitely becoming the main focus – and increasingly the advertising budgets are reducing AdWords spend and moving it to Facebook. very nice article a good read!